Inspired by the local flora and fauna, the layout of the resort is based on an imaginary gathering of animals using the shapes of cocoons and shells for the design of the studios and pools. True to the Andaz brand, Andaz Papagayo reflects the indigenous nature of Costa Rica, offers uncomplicated and personal service by real people who have a passion for their heritage and their role in the community. An open-air lobby welcomes guests, in an uncomplicated free-flowing environment, with no desks or formalities. 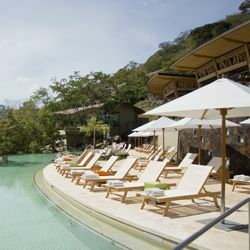 Opened December 2013, the Andaz Papagayo will feature 153 deluxe rooms, including 21 suites, nine spa treatment rooms, unique concept-restaurants with quiet and privileged views of the sea, and four meeting rooms. A vibrant, stylish and indigenous luxury resort experience to welcome your personal style.